Designing New York: Quality Affordable Housing coincides with increasing recognition of the role design plays in meeting the City’s most pressing goals. 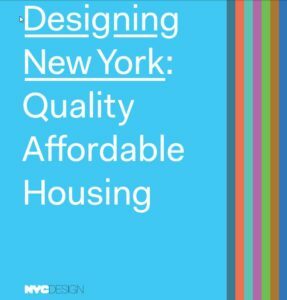 Designing New York: Quality Affordable Housing is designed to be accessible to professionals and the public. The contents should serve as a reference for New York City agencies and their applicants seeking guidance on affordable housing design. Case studies offer inspiration to the broader world of real-estate developers, designers, and affordable housing organizations to show the level of quality that can be achieved in New York City. More broadly, the publication is intended to empower citizens and community organizations to demand design excellence in affordable housing projects in their neighborhoods. The report is organized in three main sections: Guiding Principles, Case Studies, and an Appendix. These principles and case studies demonstrate that design is an important tool to address the inequalities that, unfortunately, have historically been manifested in our housing and in the built environment of our communities. The developments presented in this publication were financed through a range of government subsidies to developers. Tax incentives, low-interest loans and other subsidies, including the transfer of City-owned land, encourage developers to create affordable housing, which sometimes returns to market-rate after a certain time period. Developments built under New York City’s Mandatory Inclusionary Zoning policy adopted in 2016 or on City-owned land, leased to developers, are required to incorporate permanently affordable units. By requiring private developers to keep rents at below-market levels in perpetuity, the City seeks to provide affordable housing for generations to come. Download the PDF.